Roasted Brussels sprouts are my absolute favorite vegetable. I could make a whole batch just to snack on myself. Last weekend, we got about a pound of sprouts and half a dozen lemons in our Brown Box Veggies boxes. Lemon-flavored anything makes Dave happy; so, I got inspired. We used garlic from the garden. 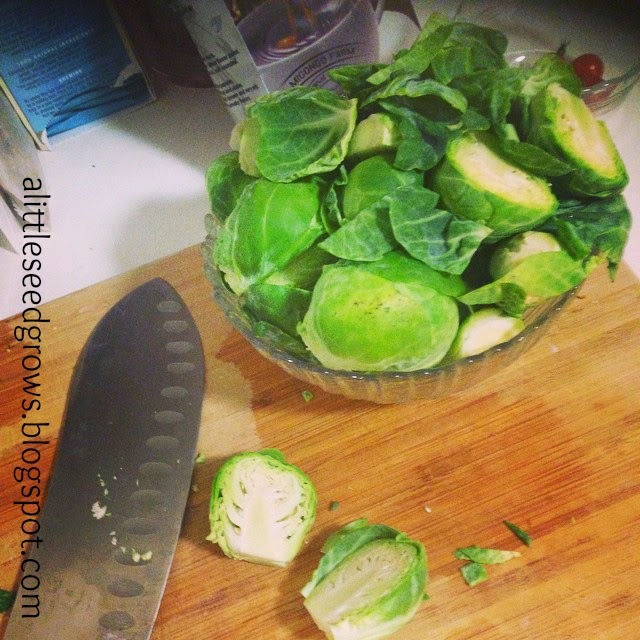 Rinse the Brussels sprouts, cut the ends off and halve them lengthwise. Mince garlic. In a square casserole dish, toss the sprouts and garlic with the olive oil. Add salt and pepper to taste. Pour lemon juice over top. Roast for about 45 minutes. Enjoy! We had our Brussels sprouts with homemade mashed potatoes and chicken. I LOVE Brussels sprouts. This recipe sounds great! Super easy, too! You should give it a shot. I'm down for anything Lemon! I need to try this.